In case you want to replace the green onions with regular onions, sweat the diced onion in 2 tablespoons of vegetable oil before adding them to the salad. ‍Mix all ingredients in a bowl. Refrigerate for 15 mins to bring out all the flavors. 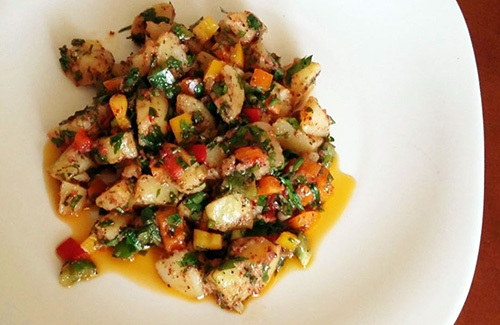 This cold zesty potato salad is just the recipe to choose when we are trying to avoid cooking in those hot summer days. This balanced meal can make you feel full only with a bowlful. Enjoy both preparing and eating this easy summery feast.